All stroke sanders "should" have a flat table of some fashion to allow placement of parts or material being worked. The size and weight capacity tends to be where the conversation ends. 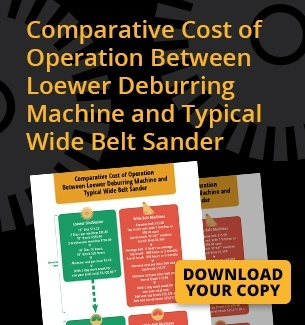 With the better machines you may even have a twin belt setup to make life and use of the machine better still. But when you get to the very best of stroke sanders an articulating mount comes into play. What they allow you to do is have the machine hold a given 3D or formed part at just about any angle or height. If you are working with a range hood for example, you can have the mount hold the part at the needed angle while you grind down the weld and blend the finish with the second belt. Before you would need to make a fixture to hold the part and it would be a one off fixture no less. With the articulating mount that is not an issue any longer. Together the features of the better stoke sanders save time per part by not needing fixtures and belt changes. Then add in the fact you don't need to remove the part from the machine for a belt or fixture change and you cut down on injury to the part as well as the staff. Watch the video at the link below to see the mount on a KBM stroke sander. And as always feel free to send in any questions we are happy to help.